How to fix the Mic not working problem Here in below you can see the image, That image says to fix the mic problem. Just you may have to do two Works of your phone hardware area, Then it will work. Changing Samsung Galaxy Ace 4 Neo G318ML mic can be a little tricky. It is soldered on the motherboard so if you remove it remember it’s placing position and put the new microphone the same way the old one was. If you have broken prints of the microphone connection points I have marked all of them in the diagram below. 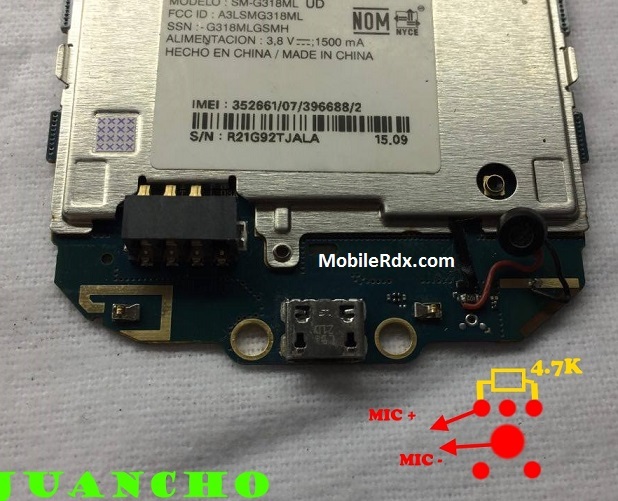 There is a very slim chance that your phones will get and Mic related problems because Microphones in Samsung Galaxy Ace 4 are soldered on the motherboard. Still if you by chance damage their soldering points here are the Samsung G318ML Microphone jumper ways. Please be careful while making any hardware solutions. The reason for the mic not working problem? A lot of reasons available for mic not working error come to Samsung Galaxy J2 phone. Therefore, we give some main reason for the problem. Keep in mind: – The every solution posted on Our website is well tested before by our specialist team, But still we do not take any responsibility for any damage it may cause to your cell phone. Use these repairing solutions at your own Risk, Thank you.